Air conditioning season never really ends in Southern California, as our current spate of hot, dry weather shows. That can make things tricky when you have an air conditioner on its last legs and you need time to get it replaced. The good news is that the weather is finally beginning to cool off, and if your AC needs replacing, now is the optimum time to do so. It gives you months of comparatively cool weather to plan for an AC replacement session, allowing you to set a schedule that matches your busy life. But how can you determine if your air conditioner is ready for replacement? Here are a few tips to help you out. The first and most important question to ask yourself is the state of the warranty. Most air conditioning systems have a warranty that lasts for about 8-12 years, which covers the cost of replacing any of the original parts that came with the system. That means in most cases that you’ll only have to pay for the cost of labor and maybe a few incidental parts such as bolts and screws. As long as the warranty remains in effect, it’s almost always a good idea to repair your system instead of replacing it. Even when the warranty has expired, it can often be more effective to schedule repairs instead of installing a new AC. This is one of the reasons why it pays to schedule regular maintenance sessions throughout the air conditioner’s life: to cut down on wear and tear and make sure that repair calls later in the system’s life are reasonable. Only when you combine an expired warranty with high costs should replacement become an option. High repair costs. If the warranty has expired and the cost of a repair session is more than you feel the air conditioner is worth, it’s probably worth investing in a new system instead of throwing good money after bad with the old one. Frequent repair costs. As your air conditioner wears out, more and more components are likely to fail and the frequency of repairs is apt to go up. 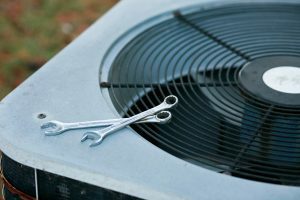 If you have to schedule more than 2 repairs on your air conditioner in a given 12-month period, that’s usually a sign that your existing unit is worn out and ready to be replaced. High monthly costs. Sometimes, it doesn’t need to be anything specific that your air conditioner has done to merit a replacement. As time goes on, every system becomes less efficient, which means it will cost you more and more every month when you run it. Eventually, the costs will get so high that replacement with a more effective unit makes the only viable option. For quality air conditioning replacement services in Whittier, CA, call Greenleaf Heating & Cooling today!